Biosecurity is strictly enforced on premises where pigs are being raised. Visitors must review the following information before planning to visit a pig farm. Biosecurity is critical to help minimize the spread of multiple diseases in the swine industry. The list of diseases is long, and they can be very devastating for the barns and/or the industry. Some example of diseases would be Porcine Respiratory and Reproductive Syndrome (PRRS), Porcine Epidemic Diarrhea (PED), African swine fever (ASF) or Foot and Mouth Disease. The impact of such diseases in barns that have never been exposed is huge: increase in mortality (PED, for example, affects young animals very severely with 100% loss for piglets under 10 days of age), loss in production (PRRS can cause abortions and poor reproduction in sow herds), increase in medication cost (to help alleviate the disease and minimize losses), etc. Depending on the disease, the stage of production and the size of the barn, an outbreak could cost a producer anywhere from a few thousand to millions of dollars. While all visitors pose a risk of introducing diseases onto a farm, international visitors pose the additional risk of carrying diseases that are not currently present in Canada such as African swine fever and Foot and Mouth Disease. The risk increases if international visitors have been around animals. These diseases can be carried on clothing, footwear and even on hands. Biosecurity protocols must be followed when visiting swine farms. The protocol below outlines biosecurity measures to be followed when visiting a farm. Visitors should read them carefully to prepare for a visit but please note that once at the farm, always follow the specific protocol developed for that farm by the producer and their veterinarian. In your vehicle, you should designate a “Clean Area/Box” and a “Dirty Area/Box”. Anything that you plan on bringing to the farm should be disinfected and stored in clean Rubbermaid containers. Please be aware that you may not be permitted to bring anything into the farm. Anything removed from the farm, as well as any supplies or soiled disposable or reusable toe rubbers, coveralls, etc., should be put in the “Dirty Area/Box” as soon as you leave the farm, so they can be disinfected. All visitors must arrive wearing clean clothes and footwear. They should carry disinfected boots, boot covers or toe rubbers. Always contact the farm manager before visiting to understand specific biosecurity protocols in effect on their farm. It is required to follow all specific farm protocols prior to visiting, which usually include a minimum of 3 nights downtime contact-free and can be up to 7 nights. When returning from an international trip, visitors to a farm should observe a 7 day downtime period. All clothing worn internationally should not be worn to the farm. Make sure you are not exhibiting signs of a cold, flu or stomach issues. If you are, reschedule the visit (as pigs can contract diseases from humans). Contact the farm manager by phone upon arrival at the site prior to exiting your vehicle. If it is not possible to contact the farm manager by phone at the time of the visit, provide them with your schedule so that they are aware of when you will be visiting and will be expecting you. 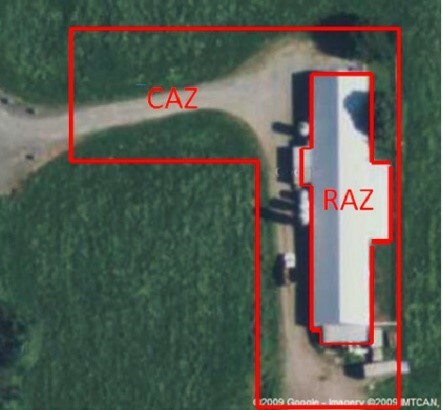 Once you arrive at the farm, park outside the CAZ (Control Access Zone), put on appropriate shoe cover-ups and walk onto the site. If you must enter the barns (RAZ, Restricted Access Zone), follow the guidelines for Entering the Barns. Obey the farm manager’s expectation of downtime between farm site visits (typically 3 nights). Bringing equipment into the barns should be avoided. If you must bring your own equipment into the barns (RAZ), clean and sanitize all exposed surfaces of equipment beforehand, preferably at least the night before (with disinfectant or alcohol wipes) and double-wrap in plastic bags, disinfecting both layers of bags. Equipment/items that will enter the barns must be kept in a designated clean area/box of the vehicle, which is clearly separated from dirty area/box. If equipment cannot be fully sanitized as described, all surfaces that can be sanitized should be and the equipment should be used within the innermost plastic bag if possible. If equipment cannot be used within a plastic bag, it should not be taken out of the plastic bag except during the immediate moments it is being used and it should not be allowed to come in contact with any surfaces, people or animals unless absolutely necessary for the service being provided. Putting equipment and other items through pass-through window, after removing the outermost plastic bag and disposing of it on the dirty side of the barn’s entrance. Proceeding through the Danish entry system, leaving shoes and disposable boot covers on the dirty side and stepping with socked feet directly into the transition area. Washing or disinfecting hands after changing out of street clothes. If the barn has shower in/shower out facilities, visitors must proceed to the dirty side of the shower, remove their clothes, undergarments, and jewelry. Visitors must thoroughly shower and shampoo, enter the clean side of the shower and put on provided barn clothes and footwear on the clean side of the transition area. Upon exiting the barn, you must proceed back through the Danish entry system in reverse, leaving barn clothes and footwear (and towels, if applicable) on the clean side. Disposable equipment, items, and clothing should be disposed of within the barn (clean side). You should stay in the barn for the entirety of the visit if possible. If you must exit and re-enter the barn during the visit, you must proceed through the Danish entry system every time. After exiting the barn, sanitize all exposed surfaces (if possible) of equipment that has entered the barn, place inside a plastic bag, sanitize the bag and place inside dirty area of service vehicles. To re-enter the vehicle, remove and fold disposable boot covers inside-out while sitting in the driver seat (with legs extended out of the vehicle), without cross-contaminating your vehicle and dispose of them in a garbage bag or in the “dirty box”. If you were using boots or toe rubbers, remove them and place them in the “dirty box”. These items must be cleaned between farm visits (washed and disinfected). Toe rubbers need to be washed, dried with work clothes and placed in the clean area. Use a hand sanitizer, and spray driver-side door, steering wheel and the garbage bag with disinfectant. If the disposable boot covers have torn, the pedals, floor mats, and footwear must be sprayed with disinfectant and washed prior to visiting another farm. The exterior of your vehicle must be washed; you can proceed to a vehicle wash facility before returning to the home site or visiting another farm. Tires, wheel wells, mud flaps and undercarriage of the vehicle must be free from organic debris after cleaning. Designate “clean area/box” and “dirty area/box” in your vehicle. Disinfect all items you plan on bringing onto the site, including boots, boot covers or toe rubbers, and place in the clean box. If you will be bringing equipment into the barn, disinfect and double bag. Inform farm manager of the visit and obtain specific biosecurity protocol information. Park outside the CAS and contact the farm manager by phone before exiting the vehicle. Put on appropriate shoe cover-ups and walk onto the site (CAZ). Discard the outer bag of the equipment you are bringing into the barn and put the equipment through the pass-through window. Leave your street clothes in the transition area, shower through (if applicable)/wash and disinfect hands and put on provided barn clothes and footwear on the clean side of the transition area. Reverse process when exiting the barn, sanitizing and bagging equipment to be removed from the barn. They should be placed in the “dirty area/box” of your vehicle once you exit the site. Place any items you are removing from the site in the “dirty area/box” of your vehicle. Sitting in the driver’s seat with your legs outside the vehicle, remove shoe cover-ups and put them in a garbage bag or “dirty area/box” of your vehicle. Use hand sanitizer and spray the driver-side door, steering wheel and garbage bag with disinfectant. Thoroughly wash the outside of the vehicle. Wait 3 nights before visiting another farm.